We already sell a large range of sew in name labels that are available in both 25mm/10mm sizing and are made from high quality double sided satin ribbon which can be highly personalised with your name, contact details and much more. 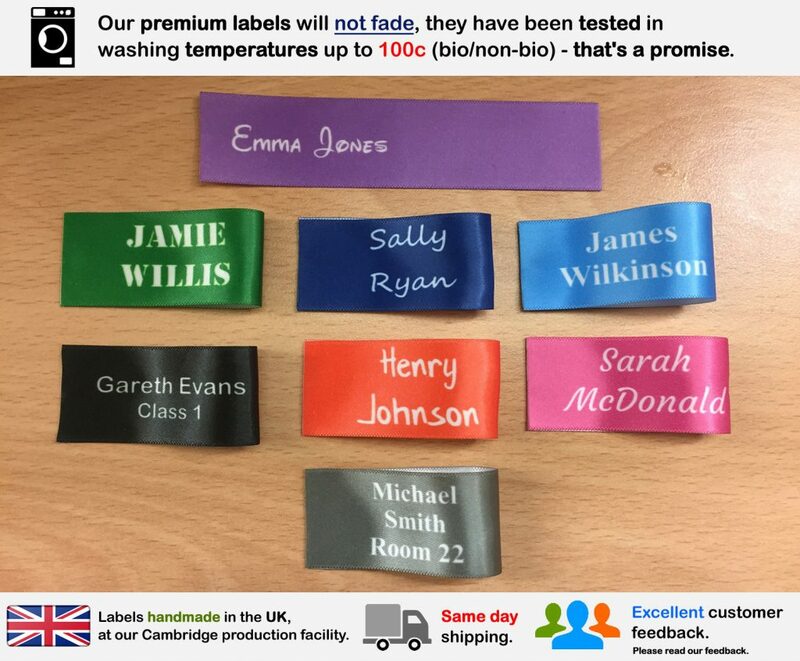 Personalisation options for these labels include 10+ fonts, 20+ solid print colours and a range of 50+ optional motif available in a wide range of categories to choose from. This post is about a new range of 25mm x 50mm labels we have available, there are 8 colours available and the same 10+ fonts to choose from also. The print colour e.g. green or pink is only printed on the front and the font colour is white. Whilst these labels don’t offer exactly the same personalisation e.g. font print colour and motifs etc as our standard white name labels they do provide something different and certainly standard out. We are still using the same high quality satin ribbon and out bespoke manufacturing processes at our Cambridge production facility. These labels will not fade unlike simliar looking cheaper alternatives. If you would like to purchase some of these labels for yourself please follow the links below.